Stick and Squeeze, are animated characters developed to help promote safe wound practices for moms and their kids. Stick (BAND-AID® BRAND ADHESIVE BANDAGES), and Squeeze (NEOSPORIN®) played to a live audience at Johnson & Johnson headquarters and were a huge success! Topspin conceived and organized “A Red Carpet Affair” launch event for their new television commercial featuring the new puppets, Stick, Squeeze, and their friends. 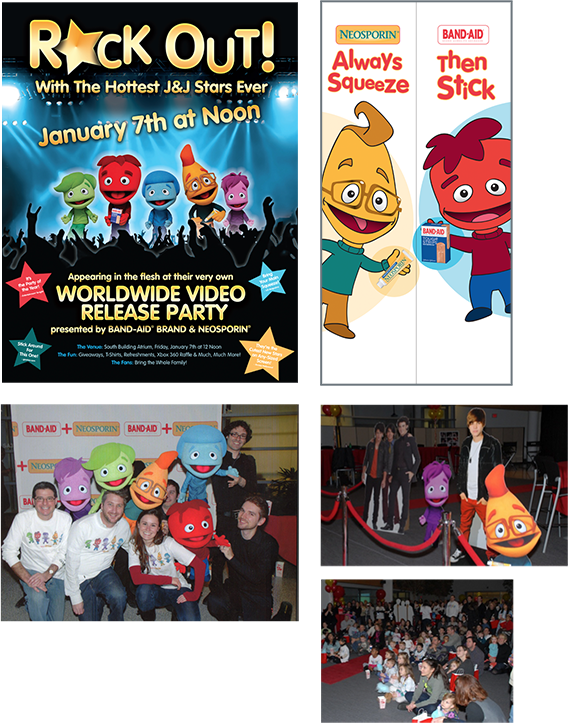 Launch events were held at J&J locations in Skillman, NJ and Lititz, PA. The events were a huge success with nearly 1,000 people in attendance. © 2016 Topspin Marketing Communications, All Rights Reserved.